The largest amusement park industry gathering in the world! 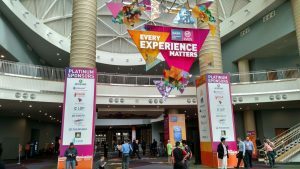 Theme and amusement park owners from all over the world have gathered in Orlando for the annual IAAPA Attractions Expo. IAAPA Attractions Expo is the largest international trade show for the amusements and attractions industry, featuring nine miles aisles containing over 1,100 exhibitors selling their attractions and services to 21,000 buyers. Theme parks and ride manufacturers announce their new rides and concepts at IAAPA so every year is a treat for theme park enthusiasts all over the world. Here is a summary of the highlights from Day 1 of the show as they happened! Join in the IAAPA 2016 discussion on our forums. Europa Park’s CEO is honoured for his work within the industry. SeaWorld unveil new for 2017 rides! The SeaWorld parks in Orlando, San Diego, San Antonio and sister park Busch Gardens Williamsburg are all getting new rides in 2017. The company revealed the trains early morning at the show. SeaWorld Orlando will be adding Virtual Reality (VR) to Kraken. The story will be set to prehistoric sea creatures. Discuss Wave Breaker on our forums. Discuss Kraken VR on our forums. Discuss InvadR on our forums. Although this train is just a concept for now, maybe somebody at the show will consider it for a coaster really soon! Read more about Gravity Group in our Manufacturers section. Zamperla announced they are to supply four thrills rides and one roller coaster for a new park, The Park at Owa, opening in Summer 2017 in Foley, AL, USA. At IAAPA 2015, Zamperla announced a new ride type called, WindstarZ. The company have developed a VR experience for the flat ride. Zamperla celebrated their 50th Anniversary by cutting a cake at the show. Read more about Zamperla in our Manufacturers section. The Themed Entertainment Association (TEA) reveal their 2017 award winners, honouring both parks and people who play a vital role in the amusement park industry. Holovis won the IAAPA Brass Ring Award for Best New Product. Busch Gardens Tampa won the IAAPA Applause Award for outstanding service to the industry. S&S unveiled a family inverted coaster with on-board audio for Dutch Wonderland, PN, USA. Read more about S&S in our Manufacturers section. Once again, Mack comes up with a crazy idea that is sure to thrill! This coaster will invert, spin and launch! The Xtreme Spinning Coaster will have customised stations allowing varying loading procedures and ride experiences. Read more about Mack Rides in our Manufacturers page. Dark ride specialists Triotech confirm three new attractions opening in Summer 2017. That’s it for our coverage from the IAAPA Attractions Expo today. Join us tomorrow when we’ll show you more of the floor highlights!